Vital Leaf’s Relief Capsules provide a convenient, discreet, and predictable dosing method. A simple, flavor-free option that’s perfect for a daily regimen or for addressing acute issues. 750mg CBD/bottle. These capsules are made with CO2-extracted, full-spectrum, water-soluble CBD from organically grown, non-GMO hemp to ensure high potency delivery to the bloodstream, through the digestive tract, and to the human EndoCannabinoid System. The technology used in this formulation is sometimes referred to as liposomal or nano-encapsulation. 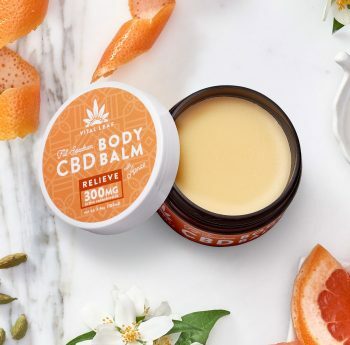 CBD processed in this way is protected to prevent being broken down during digestion, thus it transfers from the digestive tract to the bloodstream, and into the EndoCannabinoid System more effectively than other methods of administration. When it comes to the actual delivery rates in percentages, certain studies show that only 10-20% of traditionally delivered supplements are available after being broken down and digested. On the other hand, up to 90% of a supplement reaches the bloodstream via liposomal or nano-encapsulated delivery. CBD INGREDIENTS: CO2-Extracted Cannabidiol-Rich Full-Spectrum Hemp Oil, Food-Starch Modified, Organic Acacia Fiber, Xanthan Gum.